You get used to this sort of thing. When I had the flu, like most of the Western World, I sat in my chair and looked out the window. There wasn't much more that I could have done since I truly didn't have the energy, moan, coughing fit, curse, swear, moan again when will this be over. Yeah it was that bad. Literally. I was listening to a podcast from Armin van Buuren and they were talking about the "Flu Making Its Way Through Holland." at the same time I was coughing up a lung. I watched the sun come up. I watched the sun set. I watched the same people walk down my block at the same time of day. Watched the dog walkers including the guy who carries the Chihuahua who looks like its dead since it has melted over his arm. Really, dude, the dog would be happier walking on the ground, trust me. But it seems the wildlife here was the bright shining star in the nighttime that the flu induced. 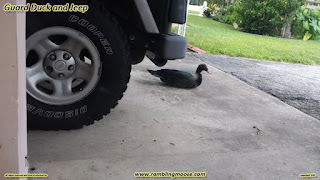 We have ducks that visit. My neighbor calls the ones that look inside the front door that is more than a meter, 6'6" of security glass, Peepers. There is a triple of ducks that visit every day. The largest has a droopy right wing, and two smaller ones. I figure it is a family. Just don't colonize under my Jeep, you're leaving a smelly mess. I eventually convinced them to relocate to my neighbor's island of flowers. The constant hosing down of the carport was a bit much. I was noticing that the butterflies here are thick on the wing. 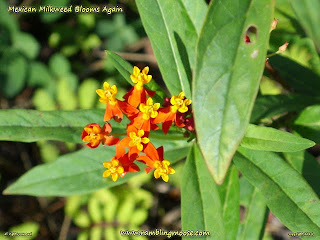 I would watch as my Monarchs would glide past looking for the Mexican Milkweed I have in the backyard for them to eat. There's a black and yellow striped Zebra Longwing that flies past occasionally. That pattern will strobe as it flies past. The point is we've been lucky. Due to the efforts of the neighbor and the various parks in town like M.E. 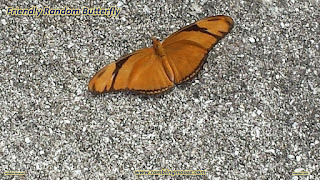 DePalma Park, we're seeing more varieties of butterflies. I have been out in the yard puttering around more than once while cleaning out my irrigation lines and had to be told to stand still as there were butterflies on my back. Plural, as in more than one. In the case of the orange one, I have never seen those before. It wanted to see me. 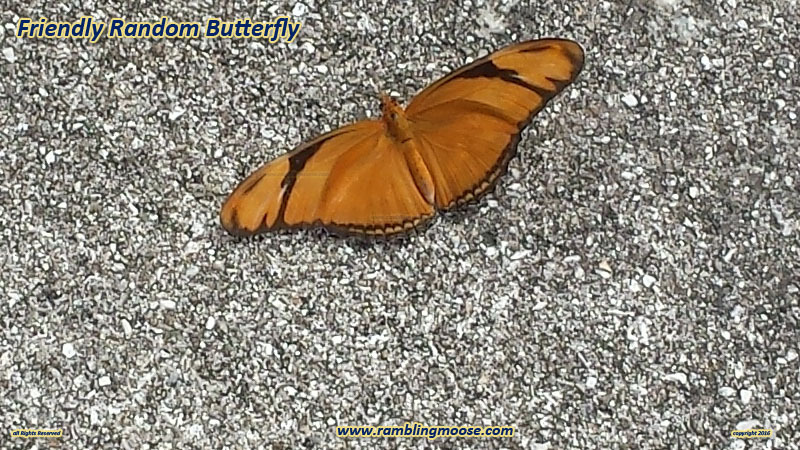 I was over by the pool and the bougainvillea looking around aimlessly, and this little beauty landed quite at my feet. I moved away, it got up and followed me. For a good ten minutes. Ten minutes is a long time to be On Guard, I suppose, but I was entertaining this little creature in the whole time. I moved to the trash can spilling water as I carried the basket from the pool skimmer, and it followed. I guess nobody wants to drink pool water except my dog. I decided that the best course was to enjoy the encounter and go about my business. Eventually it did fly away off to find more flowery fields. All a part of being in the great outdoors.